I once again had an opportunity to take a voyage on the Disney Dream in January while instructing students from Buena Vista University in Storm Lake, Iowa, on how Disney tells stories three-dimensionally, the challenges of addressing international needs and wants, how the cruise line is a natural extension of the Disney Brand and more. As always, led by instructors Jerry Johnson and Henry Hardt, it is always a delightful experience and, this year, I especially enjoyed sharing information with students like Clayton, Mason, Justin, Emma, Hayley, Jordyn, Kayla, and Maddie who kept me on my toes. The Art of the Disney Dream, Stories Behind the DIsney Dream, and More Stories of the Disney Dream. I was surprised that there were still so many things to discover on the ship that I haven't written about previously and here are a few of them that you may have missed as well. Deck 13 Aft on the Disney Dream is Goofy's Sports Deck, an open air activity center added in 2011. The area features virtual sports simulators, a basketball/volleyball court, ping pong, foosball table and more, including a nine-hole miniature golf course designed by Goofy and his son Max. On the steps leading up to Deck 13 from Deck 12 is a large piece of artwork featuring Goofy face down in a large trophy cup that was inspired by his water skiing antics in his cartoon short Aquamania (1961), which also explains the unfortunate octopus sharing the trophy as it does in the cartoon. At the top, near the elevator is another example of the ship's Enchanted Art. Goofy in his golf outfit strikes a pose over a tee and golf ball. Three animated segments can be activated. In one, Goofy swings his club and his pants drop briefly revealing his colorful boxer shorts but the club slips out of his hand and spins through the air and boomerangs back to hit him in the head. In another, as he reaches the apex of his swing, the club starts spinning like a helicopter blade, causing his entire body to twist and, as he unwinds, he lifts up into the air. In yet another, the golf ball sticks to the top of his club and when it is over his head, it drops down the inside of his clothes and makes it way down his pant leg and rolls out to make a hole in one. 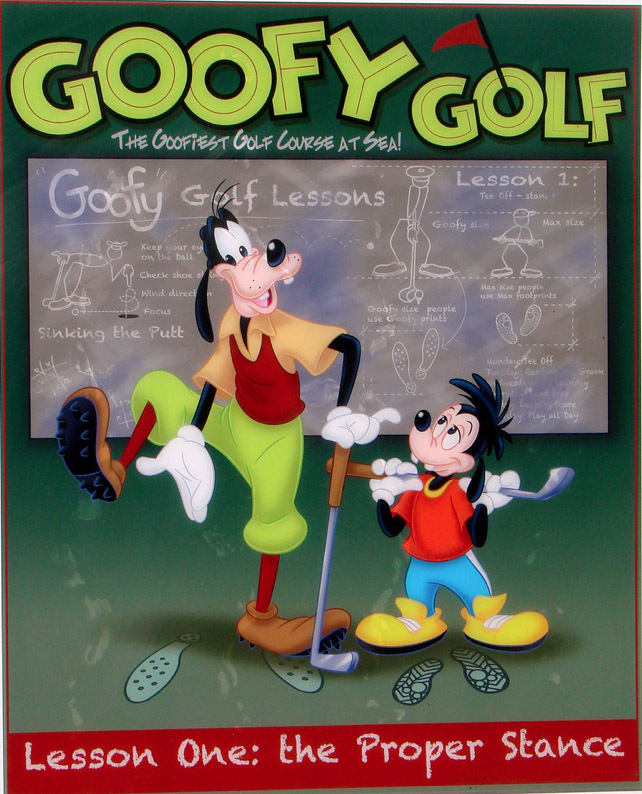 Outside is Goofy Golf: The Goofiest Golf Course at Sea! Artwork for the course was done by Disney Design Group (now named Disney Creative Group) artist Ron Cohee including the funny poster on the side of the ship of Goofy and Max striking a pose. Ron Cohee did this poster that appears outside the Goofy Golf activity on the Disney Dream. How To Play Golf was a Goofy animated theatrical short released March 10, 1944 as part of the humorous series where a pompous unseen narrator explains how to do something and Goofy attempts to demonstrate with hilarious results. The cartoon is so well known and beloved that it was parodied recently in the 2016 Disney Channel Mickey Mouse cartoon "Good Sports." In the 1992 Goof Troop episode "Tee for Two," Pete plans to tear down the local miniature golf course to put up his emporium so Goofy and Max have to step up to save the course so they have some experience with mini golf. With all these references, it is not unusual to have a miniature golf course inspired by Goofy, nor is it unusual to feature some comical additions. A nearby sign warns "Please do not throw anything overboard even if it was a Goofy shot" yet I wonder how many golf balls have found their way into the Atlantic Ocean. Hole 1: Obstacles include twisted sports equipment including a hockey stick (property of Max), cricket mallet, baseball bat and golf club. Hole 2: The golf ball needs to go through the broken lens of a pair of glasses surrounded by a beach ball, soccer ball and basketball. Hole 3: This is a "dog-leg" hole which is a crooked hole like the hind leg of a dog. Basically, it goes straight down the fairway and then bends or veers. So, of course, this hole features dog-related items like a fire hydrant, a "mega-bites" dog biscuit with a bite out of it and a dog collar. Hole 4: This hole features a lawn mower. Hole 5: Signs warn No Swimming, No Diving, No Fishing with Goofy silhouettes on them doing the actions. Obstacles include children's beach buckets filled with shark fins and an octopus' tentacles. There is also a large clam with a pearl in it. Hole 6: A huge sand castle dominates this hole and includes a crab, large flip flops and a plastic bottle of Goofy Suntan Oil labeled "SPooF 90". Hole 7: A tribute to pirates, this hole has two fortress pillar towers, a cannon and stacked cannon balls. Hole 8: This hole features a giant magnifying glass next to a huge book titled Playing the Angles: Mathematics for Golfers by Professor Ludwig Von Drake. It is open to pages 626 and 627. "Dotted lines indicated probable paths of the golf ball (O through T) taking into account the topography of the green U, the type of grass V and the angle of the grass has been cut by lawn mower W and the weight of the greens keeper X over the weight of the earth Y but mostly influenced by pure luck Z". Page 627, has the top half of the page filled with equations and the bottom half a dotted line diagram depicting the description on the previous page. Hole 9: This hole is literally the "kitchen sink" with obstacles including plates, cups, and a teapot. In the Meridian Bar on the Disney Dream, between the upscale restaurants Remy and Palo on Deck 12 Aft, is a book case filled with authentic nautical themed books including The Greeks and the Sea, The Overlook Illustrated Dictionary of Nautical Terms, The Dictionary of Nautical Literary, American Nautical Art and Antiques, Knots and The Nautical Chart among others. However, there is a also a copy of the famous 1930 detective novel (so it ties in with the 1930s theme of the ship) The Maltese Falcon by Dashiell Hammett standing upright next to a reproduction of the famous black bird statue that features so prominently in the story. The Disney Fantasy cruise ship also has a Meridian Bar with authentic nautical themed books in its bookcase, but no copy of The Maltese Falcon and the statue. Why? It is because some clever Imagineer remembered the final line in the famous film when Sam Spade was asked what the bird figure was. His reply? "The stuff that dreams are made of." Lights that resemble gas lamps, but are actually electric, overhang the bar counter, which is inscribed with the word "Welcome" in nine different languages: Welcome, Bienvenue, Hosgelpiniz, Velkommen, Benvenuti, Wilkommen, Bienvenidos, and character letters in both Mandarin and Japanese. There are passport stamps on the wallpaper (from Canada, Australia, the Bahamas and other locations), a world map etched into the windows, a sextant design on the floor, and couches with luggage straps on them. The only "Disney" reference in the area is the Disney Cruise Line logo in the middle of the overhead chandeliers. There are 22 pieces of Enchanted Art on the Disney Dream, but only 13 of them are used in the Midship Detective Agency adventures and I have always wondered why. I just assumed that to keep the activity from going on forever, Disney decided to limit the number of stops that needed to be made to accomplish the tasks and that is probably the primary reason. Enchanted Art are in frames, usually by the elevators and stairs, that look like ordinary photos or posters, but will spring to life when the proximity sensors indicate someone standing in front of them. Each image has three variations. However, I discovered that one of the reasons four of the Enchanted Art pieces are not included are because they would be inaccessible to the general public during the cruise. Two pieces of art are in the children's only area. In the Oceaneer's Lab, in Andy's room, there is a bulletin board that mysteriously changes its postings; elsewhere is an image of Mr. Gibbs, Captain Jack Sparrow's first mate, from the Pirates of the Caribbean franchise, that springs to life and talks to young guests. So the only time an adult might see it is on that first day when there is an "open house" of the area. In the adult only section, the Skyline bar has a poster that, of course, changes when the skyline behind the bar changes to a different city. What most guests probably don't realize is there is a proximity monitor to the lower right of the frame and triggering it can cause things like a silhouette of Mushu, the dragon from Mulan, appearing in the lamp when the city is Hong Kong, or a green vine growing around the lamp among other hidden treasures. The other adult only location for a piece of Enchanted Art is an image of The Three Caballeros (Donald Duck, Jose Carioca, and Panchito) by the Cove Café coffee bar on Deck 11 forward. By the way, on Deck 5 Aft, by the elevators and stairs, are two adjacent pictures of a pirate ship and an old fort. The two interact with the ship firing at the fort just like in the famous Disney theme park attraction, Pirates of the Caribbean. In fact, the sounds that are heard are taken directly from the soundtrack for that attraction. However, this cruise was the first time I realized that it is set up so that the gap between the pictures is meant to suggest you traveling in the ride vehicle between the two images. It was also the first time I realized that, because some artwork is matted, the way the lighting is set up results in the effect that the artwork on the left hand side has a perpendicular shadow across the top of the picture. Of course, that would not be the case on a high definition screens on the right-hand side, so Imagineers added in a digital perpendicular shadow across the top of the image to match the real pictures. Acclimating yourself on ship can be a challenge so here are some clues. Personally, I love maps but sometimes they can be misleading and confusing. If your stateroom has a fish on it, then you are on the port side, since it has the same number of letters as "fish" and the word "left." It is not a specific Disney fish like Flounder because then it wouldn't have the right number of letters. If you are on the starboard side, your stateroom has a seahorse because it is roughly the same number of letters. Starboard is right when you are facing forward. To tell whether you are forward or aft, look at the design in the carpet. If it is upright, then you are heading forward. If it is upside down, you are heading aft. Those semaphore nautical flags that decorate the design spell out "Disney Dream" just as a different set spell out "Disney Fantasy" on the sister ship. On the carpet in the hallways are a series of five-pointed stars. The top of the star always points forward. The carpets outside the elevators on the aft side are yellow, the ones midship are blue and the ones forward are red. The Disney Magic debuted in 1998 and its godmother was Patty Disney, Roy E. Disney's wife. The Disney Wonder debuted in 1999 and was the first vessel to have an animated character as a godmother: Tinker Bell. The Disney Dream debuted in 2011 and Jennifer Hudson was the godmother because she got one of her earliest breaks before American Idol by appearing as a performer on the Disney Wonder. Sometimes I need an anvil to fall on my head. For years, I always just assumed that Mariah Carey was the godmother of the Disney Fantasy because she was a popular star and Disney wanted to utilize a friendly celebrity. 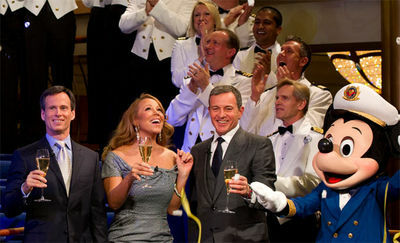 Mariah Carey was named godmother of the Disney Fantasy and christened the ship in 2012 in New York. It wasn't until this trip that I realized that the singer's lead song on her Daydream album was titled "Fantasy," was the first single by a female artist to debut at No. 1 on the US Billboard Hot 100, went on to top the chart for eight weeks, and became the second best-selling single of 1995. Carey had also performed at the Disney Parks Christmas Day Parade in both 2005 and 2010 and, in 2011, became a proud parent of twins Moroccan and Monroe (aka Roc and 'Roe), so that factored into the family aspect of the cruise ship. Carey christened the Disney Fantasy in March 1, 2012 on the Hudson River in her hometown of New York City. The Disney Fantasy was the first in the Disney fleet to be christened outside of Port Canaveral, Florida. Shipbuilding is filled with traditions and superstitions like having a coin in the keel or under the mast. Wine poured upon the deck before a long voyage represents a libation to the gods which will bring good luck. "Christening" a ship by breaking a bottle of champagne across her bow at the time of launching came from this practice. "I christen thee Disney Fantasy. May God bless this ship and all who sail on it," Carey said as she stood next to Disney CEO Bob Iger Walt Disney Parks & Resorts Chairman Tom Staggs, and Mickey Mouse, who was attired in his captain's outfit as images of Carey's husband Nick Cannon and Minnie Mouse breaking a bottle of champagne outside the ship streamed into the atrium. A two-minute video of the event can be seen at this link. Unfortunately, her erratic behavior and hospitalizations might have been the reason that ex-Mouseketeer Britney Spears was never asked to be the godmother for the ship, even though in 2005 she launched her popular Fantasy fragrance line. The Disney Dream was designed in an Art Deco style that generally means geometrical and symmetrical patterns, sharp lines and bright colors. However there is one area of the ship, designed to echo Art Nouveau style, that is the prominent feature on the Disney Dream. It was felt that Art Nouveau, with its more romantic style of curved lines, pastels and references to nature, was more suitable for the restaurant Remy. In fact the doorway resembles peacock feathers, an element of Art Nouveau. One of the wines displayed for sale in Remy on the Disney Dream is a bottle of the 1947 Chateau Cheval Blanc. Another bottle exists in the Remy restaurant on the Disney Fantasy. The Disney Fantasy used to have two bottles, but sold one to a guest for $25,000. Less than 20 bottles still exist worldwide. I believe Napa Rose at Disney's Grand Californian Resort & Spa also has a bottle. In the Pixar animated film Ratatouille (2007), restaurant critic Anton Ego orders a bottle of the wine in Gusteau's restaurant with his meal. The wine is often used as a benchmark of excellence but is described as a "happy accident." Born of aberrant blazingly hot weather (literally roasting the grapes on the vine) on the right bank and vinified under primitive conditions that produced residual sugar and volatile acidity levels, it is a wine full of technical flaws that turned out delicious in spite of itself and has been lauded by the severest critics. On the flight of stairs leading up to Deck 12 Aft, there is a huge piece of artwork that depicts Remy the rat looking in from the skylight into Gusteau's kitchen. The Disney Cruise Line is a very successful extension of the Disney brand and I am continually amazed at all the subtle details throughout the ship and how many guests, including myself, take them for granted because they are so natural. From the shower curtains that have a faint image of a ship's rope that occasionally twists into a silhouette of Mickey Mouse's head, to the Mickey cupid on top of the fountain in the Enchanted Garden restaurant meant to be an homage to one of the fountains in Versailles. It would evoke the classic age of cruising from the 1930s, so there would be a feeling of timelessness. There would be modern amenities but they would not be pronounced but hidden. It would have the elements of Disney storytelling. It would be transformational so that guests felt they were in a new place and story.